The Noble Prize winning José de Sousa Saramago was born in Azinhaga, Portugal on November 16, 1922. He was a Portuguese journalist, translator, novelist, playwright and poet. His work has been translated into 25 languages with a sale of two million copies of his books in Portugal. Before Saramago gained international recognition as a novelist in his 50s, he was an editor of a newspaper during 1974 to 1975 and also a member of the Portuguese Communist Party in 1969. 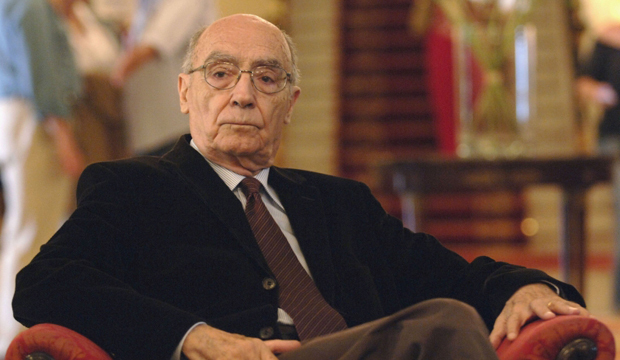 Spending a life of scarcity, Saramago grew up under difficult circumstances in Lisbon. He supported himself by working as a mechanic and metal worker before obtaining a job at a publishing company leading to becoming a translator and journalist. In 1944 he married Ilda Reis, a typist. However, the marriage ended in divorce 26 years later. After joining the Portuguese Communist Party in 1969, Saramago began writing poetry, publishing many volumes. He also worked at a Lisbon newspaper for a year before he lost his position due to overthrow of the dictatorship of António Salazar which led to an anticommunist backlash. Saramago later stated in an interview, “Being fired was the best luck of my life; it was the birth of my life as a writer”. He devoted himself completely to writing since 1979. He married once again, a journalist named Pilar del Río. Saramago settled in the Canary Islands, going into a self-imposed exile after his 1991 book O evangelho segundo Jesus Cristo (The Gospel According to Jesus Christ) was banned by the government. He remained there for the rest of his life, dying on June 18, 2010. Saramago’s literary career saw the publishing of many poems, libretti, short stories, plays, novels, travelogues and diaries. His first novel, Manuel De Pintura e Caligrafia was published in 1977. In 1980, he published Levantado Do Chao followed by Viagem a Portugal in 1981. His best known novel, Memorial do convent, released in 1982 is the story of a handicapped war veteran and his lover who use a flying machine powered by human will to flee their difficult state of affairs set against the 18th century backdrop of Portugal. Among Saramago’s other noted works are O ano da morte de Ricardo Reis (1984), A jangada de pedra (1986, also filmed as The Stone Raft in 2002), Historia do cerco de Lisboa (1989) All the Names (1995), Blindness: a novel (1995), The Cave (2000), O Homen Duplicado (2002), Ensaio sobre a lucidez (2004), As intermitncias da morte (2005), Ensaio Sobre a Lucidez (2006), A viagem do elefante (2008) and Caim (2009). Saramago also authored several volumes of poetry and autobiographical works such as As pequenas memórias (2006). José Saramagio became most famous for his controversial novel, The Gospel According to Jesus Christ in which Saramago hypothesizes Jesus Christ as an innocent soul caught between the differences of God and Satan. His outspoken atheist views were despised by the Roman Catholic Church leading to a ban and also blocking the book’s entry to the European Union literary contest in 1992. However, it was given permission to participate in the contest after much international protest. When Saramago became the first Portuguese language writer to win a Nobel Prize in 1998, he was an established and widely read writer all over Europe.